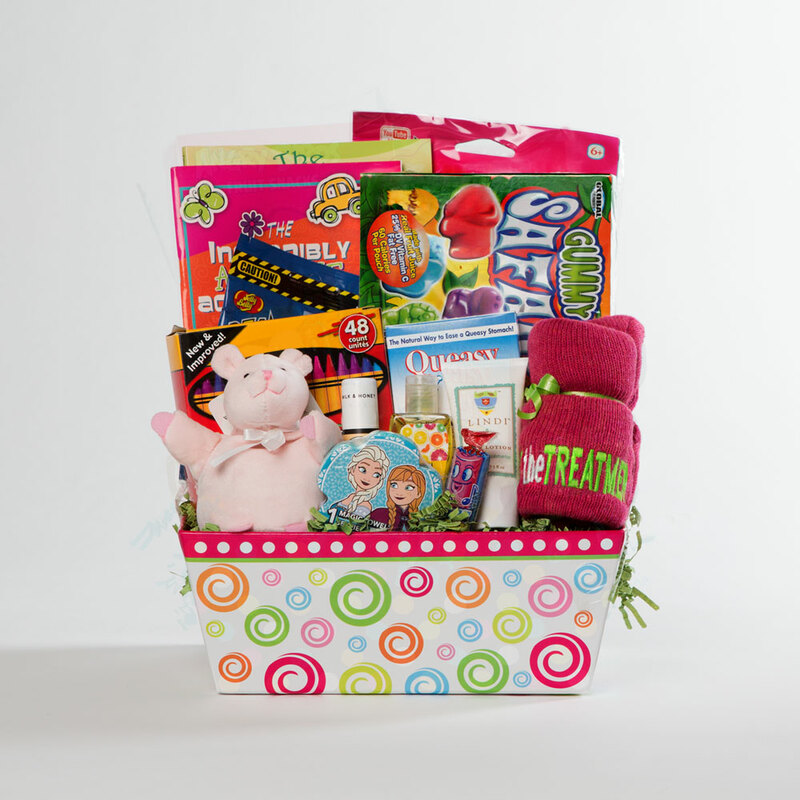 Large Chemotherapy Basket for Kids of All Ages! 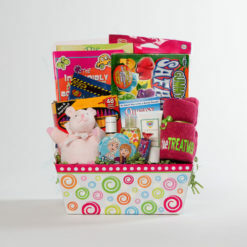 This deluxe kid’s gift basket is chock full of all the items a child undergoing chemotherapy will need. All of the items in this child’s chemotherapy basket have a specific purpose and will serve to help ease the nausea of chemotherapy, nourish the skin, keep the mind occupied during treatment, provide a “friend” for comfort, or just make any boy or girl undergoing cancer treatment smile. 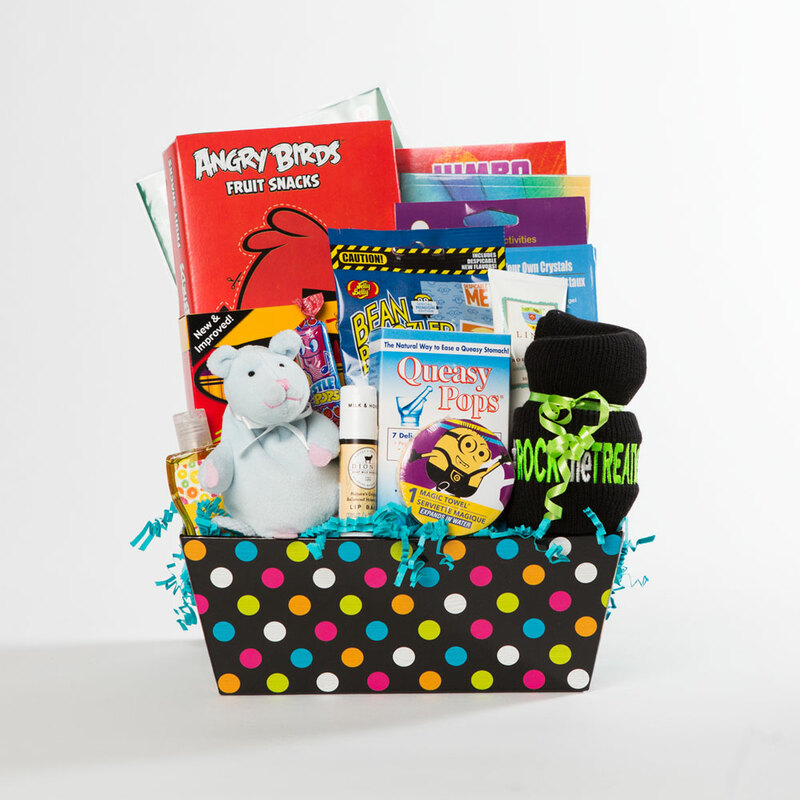 This big-hearted cancer gift basket provides more than the essentials needed to help young cancer patients ROCK the TREATMENT™! Lindi Skin – Dry and irritated skin is one of the most common effects of chemo treatment, which is why it’s important to have products readily available that can offer some relief. This product from Lindi Skin is specially formulated for chemo patients and is a wonderful lotion to keep skin moisturized and healthy. Dionis Goat Milk Skincare – The chemical makeup of goats’ milk, particularly its pH, is very close to human skin, which makes it easy to absorb and moisturize. Being that chemo patients can struggle to keep their skin moisturized, this makes Dionis’ goats’ milk products a perfect fit. Dionis Goats Milk Lip Care– Like their lotions, Dionis’ goats’ milk lip balm is also great for treatment patients who struggle to keep their lips moist and hydrated. Queasy Pops – One of the toughest parts of chemo treatment is constant nausea. Since you can’t just take anything to help alleviate it, having these Queasy Pops on hand is a huge help. Made from natural ingredients and without drugs, these suckers are a delicious way to stave off the regular sickness treatment patients experience. Chemo Caps – Staying warm and comfortable is a challenging objective for all treatment patients, which is why we love to include these hand-knit hats, which are made just for Rock the Treatment baskets. Hand Sanitizer – Chemotherapy can be very hard on a child’s immune system, which is why it’s so important to stay clean and germ-free. Girls Book: The Bald Headed Princess – Dealing with cancer and treatment at a young age is a terrible thing that can lead to a host of questions, concerns, and fears. One of the best ways to deal with these is not to hide from them, but to help a child realize that they are not alone and that their life can still be fun, enjoyable, and normal. That’s why we love this book, which encourages children to stay grounded in who they are even as they deal with this very tough disease. Boys Book: Imagine a Rainbow – One of the toughest things for any child to learn when dealing with cancer and chemo treatment is how to handle their fears and anxieties. It’s a difficult thing for an adult to deal with, much less a child! That’s why we love this Imagine a Rainbow book, which encourages children to imagine a number of things that help them focus their minds and deal with the pain they’re experiencing. Spa Comfort Pocket Critter – The best gifts for cancer patients are often those that serve a multitude of purposes, and these Pocket Critters are no exception. Children will love to keep them close by to keep them company, but they can also be heated or cooled for spot treatment of bumps and bruises. They also smell great (they’re infused with lavender flowers) and are easy to wash.
Activity Book & Craft Projects – Solving puzzles, coloring, and engaging the mind are all important for staying focused, engaged, and hopeful. 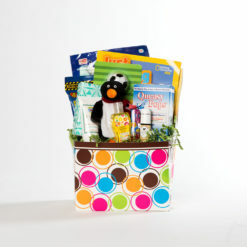 This activity book, along with the craft projects, are all perfect for any child going through treatment and will ensure that they always have something fun and interesting to keep their mind occupied. Jelly Belly Bean Boozled – What’s better than a bag of Jelly Bellys? A bag of Jelly Bellys that is also a fun game! This set of jelly beans are made up of different flavors of the same colors, some of which are tasty and fruit flavored, and some of which are funny flavors like toothpaste and pencil shavings. It’s a lot of fun for any child who could use a welcome distraction and some delicious snacks. Fruit Snacks – When struggling with nausea that comes with chemo treatment, it’s important to have some yummy, healthy snacks on hand that will help a little one Rock the Treatment! Whistle Pop – Whistle pops are a fun, enjoyable snack that children just love. Not only do they taste great, but they work like real whistles. Controlling the plastic stick in them, you can create different pitches – that is, if you don’t eat it first!